Possibly the best DJ controller out there, but you'll want some extra gear to get the most out of it. Flexible range of I/O. Massively intuitive control of Traktor's 'deep' features. Screens and touch- sensitive controls shift focus away from the laptop. No jog wheels. Not really an 'all-in-one' device. Back in 2013, Native Instruments MKII S2 and S4 Traktor controllers arrived they were met, perhaps unfairly, with a certain amount of disappointment. It was clear that NI had opted for refinements rather than reinvention. However, it transpires that NI wasn't throwing everything and the kitchen sink at their range because it had something newer, more feature-packed, and more ambitious in the works. Enter the Traktor Kontrol S8. The S8 is Native Instruments' most expansive piece of DJ hardware to-date, both in terms of its features and its sheer size. It's significantly larger than the S4 in both depth and width and, although it's actually more lightweight than it looks, it's not the sort of thing you could simply bring to a club without prior warning and hope there's room in the DJ booth. Given that, even once you've made space for the S8 itself, you'll still need a laptop and possibly some additional gear (more on this later), we'd suggest that the space- conscious look elsewhere. "Flipping between digital and analogue mode is as simple as pushing the Traktor Mode button at the top of each channel"
The S8 is clearly a quality piece of kit, however. It looks fantastic and feels very well built. The quality of pads and knobs will be familiar to anyone who has tried the S4 MKII or Maschine Studio, while the new replaceable fader section - which we're told uses a special inverted design to offer maximum durability - is the sort of properly 'pro level' touch that we'd expect at this price point. With its backlit controls, LED-lined touchstrips and hi-res displays, the controller really looks the business in a darkened club environment and proves easy to navigate under all lighting conditions. Which is lucky, because the S8 really does have a lot going on. The unit is centred around a four channel mixer that can control a quartet of software channels, act as a standalone analogue mixer, or any combination of these two options. Flipping between digital and analogue mode is as simple as pushing the Traktor Mode button located at the top of each channel and, with built-in digital vinyl support and an impressive range of I/O (see In & Out), this makes the S8 a truly flexible modern DJ 'hub'. Aside from the redesigned faders, the most notable feature of this mixer's channels is the addition of backlit on/off switches for each of the bi-directional filters; something which was a notable omission from earlier NI controllers. To either side of the mixer is a pair of deck controllers. Along the bottom of each is the transport section, with Play, Cue, Shift, Sync, Deck select and a button for toggling Traktor's beat-locked Flux mode on and off. Above this is a grid of eight pads, the functions of which can be changed via a strip of buttons along the outside edge. In Hotcue mode the pads are used to assign and jump between eight cue points, while Loop mode allows the user to create a loop and trigger beat jumps. In Remix mode the pads trigger eight of the software's 64 available Remix Deck sample slots. Finally, Freeze mode adds a feature from NI's iOS app Traktor DJ, which instantly 'grabs' a loop from the current track, slices it into eight and allows each slice to be triggered as a one shot sample. Above this sit four faders, which control the volume of the four Remix Deck slots, along with a large rotary that serves a number of purposes - it's primarily used for selecting and editing the size of loops, but also handles scrolling through the bank of Remix Deck samples, editing slices in Freeze mode and selecting a source for the loop recorder. Above this is a row of rotaries that control the Remix Deck filters, effects sends and pitch, each with On/Off buttons. Finally, along the very top is a row of four effects rotaries, plus an FX Select button, offering control over the software's effects. There is, however, a pair of very noticeable omissions from the S8's control set: jog wheels. We'll lay our cards on the table - when we first caught sight of the S8, this was something of a concern. We like jog wheels, or more accurately, we like to have something spherical that at least tries to replicate the feel of a turntable. This reviewier is no DMC champion, but he is the sort of semi-Luddite who will turn off sync when DJing with the S4. It's not that Traktor's beat detection algorithms don't work - they're great, as are all the tempo sync'd performance features - but personally, this writer tends to get bored quickly if everything feels too 'on the rails'. "The S8's intuitive control over Traktor's deeper features is absolutely unrivalled"
NI claims that the new touchstrips can be used in place of jog wheels and there's some truth in this. With a track stopped, these can be used to 'scratch' the current track, while holding down Shift puts them into Seek mode, allowing the user to jump to any part of the track. With the track playing, these become Pitchbend controls, which - to be fair - are surprisingly well implemented and can be used for basic, 'nudge'-style beat-matching. The absence of pitch faders rules out any serious beat-matching though. Tempo adjustments are all performed via a single central tempo rotary, which by default slowly fades between bpms and requires a Shift press to make quick adjustments. Outside the realms of basic House and Techno, this is all too fiddly, and does seriously hamper the idea of the S8 as an 'all-in-one' controller if you want to mix with less 'rigid' genres like Funk or Soul. Which brings us to probably the main point of this review: despite what NI says on the box, it's best not to think of the S8 as an 'all-in-one' device. 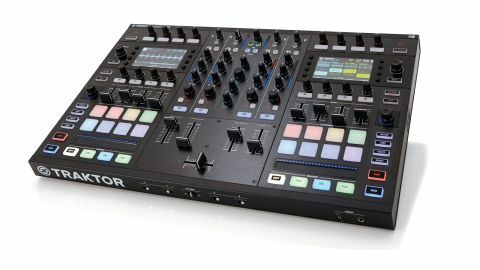 The unit features built-in DVS support and comes with the full version of Traktor Scratch Pro, and connecting turntables or CDJs really brings the S8 to life. With external gear handling the track control part of your set-up, it frees up the main body of the S8 to make the most of Traktor's advanced features. And in this area the controller is a serious joy to work with, thanks primarily to its best feature - the pair of screens. While they're not particularly large, the implementation of these screens, coupled with the touch-sensitive controls, is absolutely fantastic. From library browsing to looping, sampling, tweaking the effects and beyond, they offer clear information exactly when it's needed. Suffice to say, they make it entirely possible to perform a set using Traktor, Remix Decks and all, without the need to look at a computer screen. While it's lacking a little in the beat-matching department, the S8's intuitive control over Traktor's deeper features is absolutely unrivalled. Plugging a bit of extra 'analogue' gear into it transforms it from an interesting controller into a next-level hybrid DJ set-up. In our tests we used a pair of turntables, plus a drum machine on a third input, sync'd via the MIDI out. In this state, the S8 is probably the best digital DJ device we've ever used. The ability to flip seamlessly between real and control vinyl, analogue and digital sources, live sampling and looping from the inputs, all easily and intuitively, is so much fun and inspires real creativity. If you're after an all-in-one controller for casual use, the S2 or S4 may still be your best option, but if you're willing to commit to the whole space and wallet-sapping package, the S8 is the real deal.